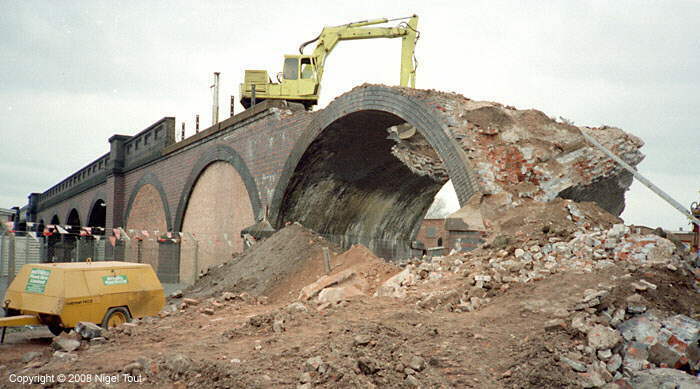 A selection of photographs of Great Central Railway buildings and bridges south through Leicester to the Central Station around the time of demolition. 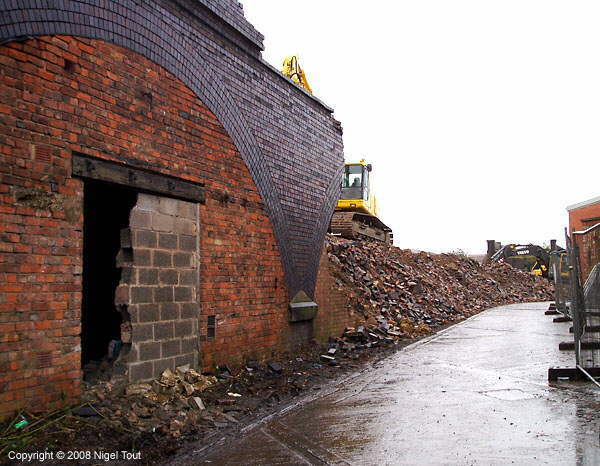 Unfortunately, there are no photographs on this page of the demolition of Leicester Central, though some are shown on the ‘Last Day & Demolition’ page here, and some are also available on the Railway Archive site and on the Image Leicestershire site (search here for Grand Central Station). 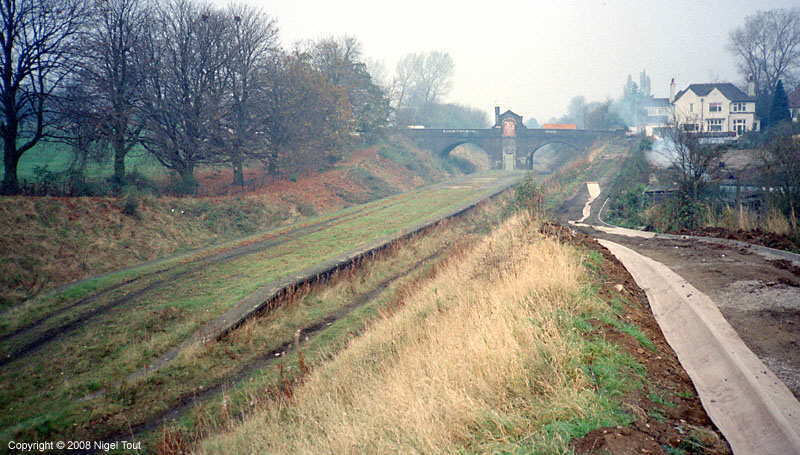 The original station of Belgrave and Birstall station in 1976, looking south, when the track was in the process of being taken up. 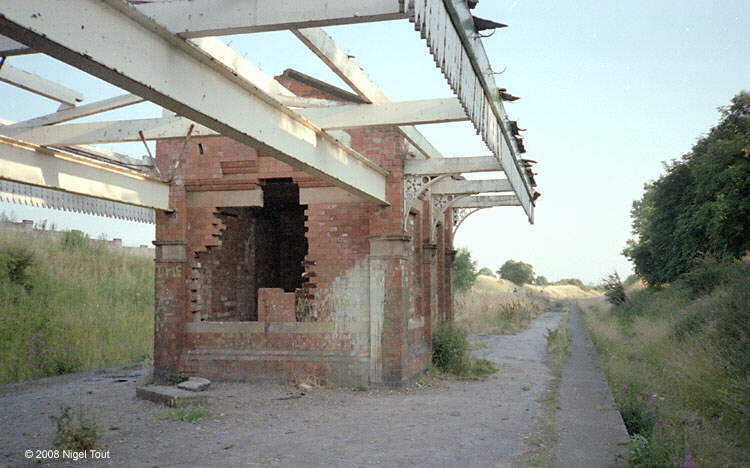 Later the much vandalised station buildings were demolished by the new preserved Great Central Railway. A new station called Leicester North was built as a terminus station beyond the end of the platform shown here, and the track was relaid in a new layout. 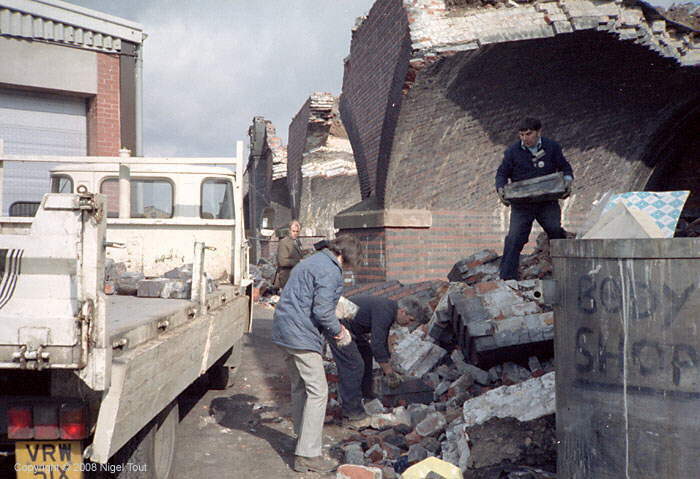 By 1981 the buildings at Belgrave and Birstall were showing severe effects of vandalism, and later had to be completely demolished for safety reasons. 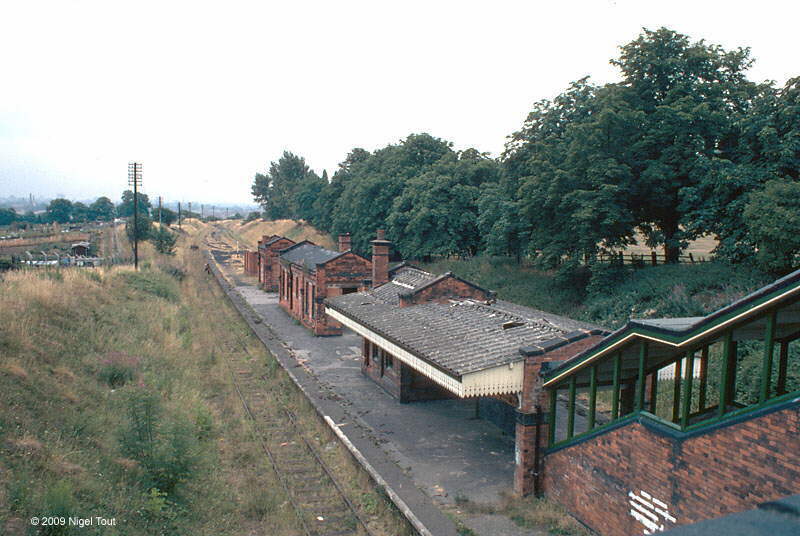 Another view of the derelict Belgrave and Birstall station in 1981. This was the view of the cleared Belgrave & Birstall station in the late 1980s when the public footpath alongside was being laid. 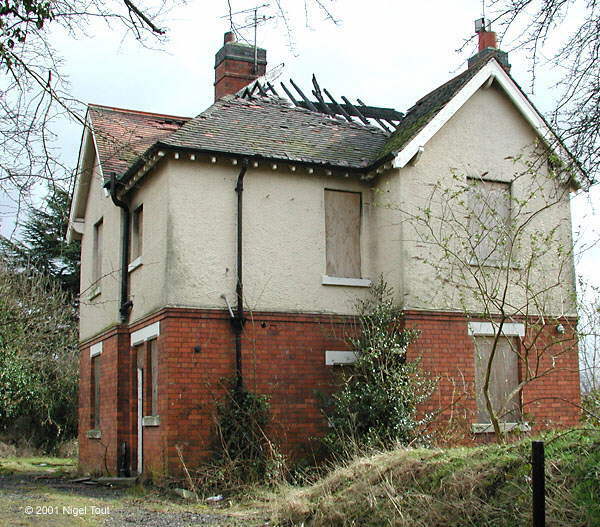 The Belgrave and Birstall station master’s house in a woeful and dangerous state in summer 2001, before demolition. This is now the the ‘Greenacres’ site with its small work units. In the late 1980s the high embankment just to the south of Belgrave & Birstall station was removed to make way for a new section of the ring road. The work has just started in this view, looking east and standing on what would become Red Hill Way. Looking east from the top of the embankment along the line of the new ring road towards Red Hill roundabout where preperations are under way for the flyover which was to be built there. The embankment here has been replaced by a footbridge over the ring road, Red Hill Way. This is the view from the top of the embankment looking south towards Leicester. 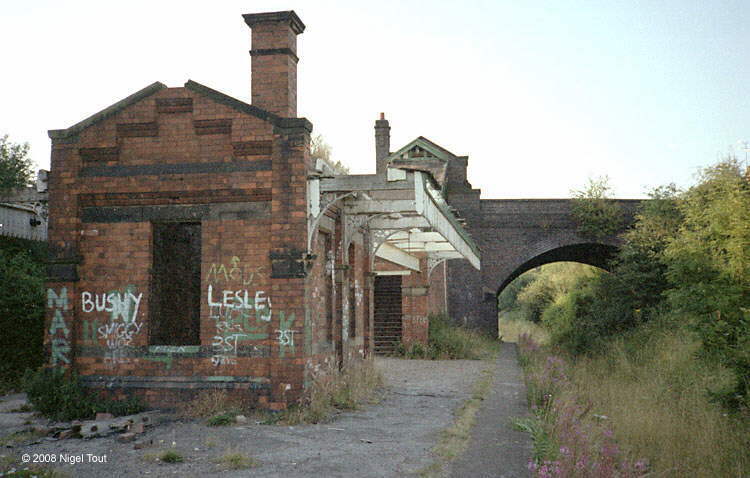 This spot is now on the entrance road leading to Leicester North station on the preserved Great Central Railway. Thurcaston Road bridge during demolition, looking north, Sept 1979. Looking south along the trackbed, just south of Thurcaston Road, showing the small bridge over Millbrook Walk. This is the site, now very overgrown and bridge long gone, of a rejected planning application made in December 2007 for dwellings and a linear park. 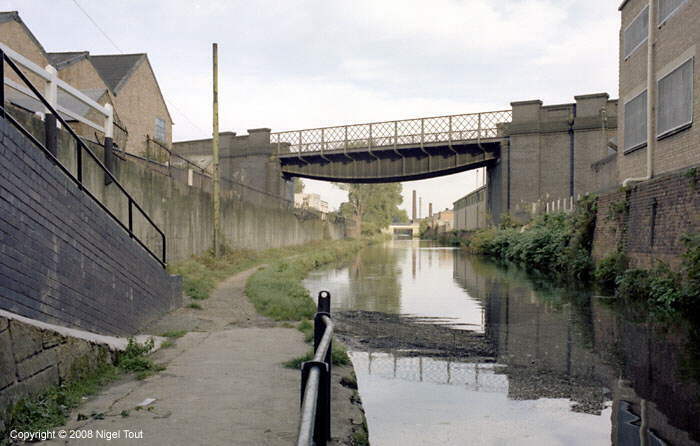 The west side of the bridge over Beaumont Leys Lane immediately prior to demolition in Sept. 1981. The embankment has been partially removed on both sides, ready for work to begin. The east side of the bridge with demolition nearing completion. Further towards the city, just north of Blackbird Road, was Abbey Lane goods sidings. 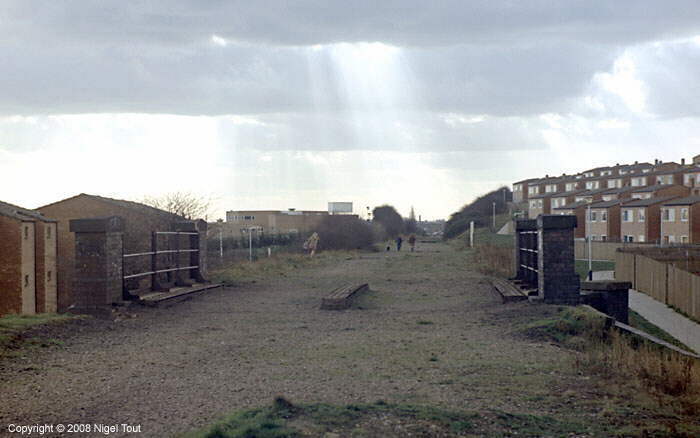 Here in 1979, looking north, it was a scene of dereliction with the goods platform and its canopy standing in the middle. 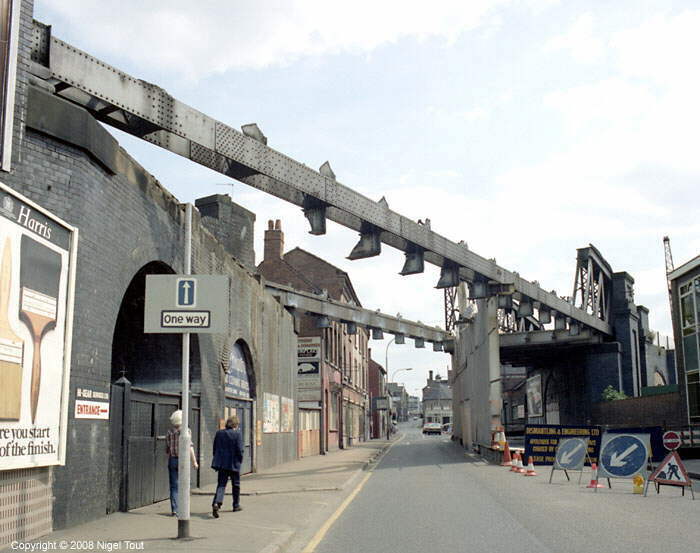 The canopy on the goods platform got a further use when it was used as a secure compound during the redevelopment of this area into a small industrial estate, seen here in 1987. The canopy on the goods platform of Abbey Lane sidings transformed into a secure compound, 1987. The bridge over Blackbird Road in the late 1970s. 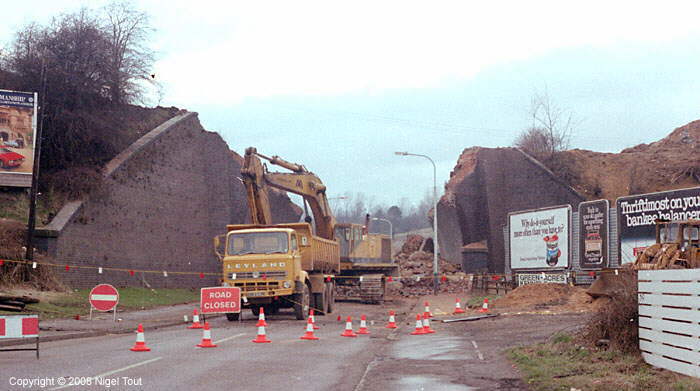 Blackbird Road bridge with demolition well under way, 1979. Panoramic photograph looking north over the partially demolished Blackbird Road bridge. The final girder of the Devonshire Road bridge is here being cut up, looking west. 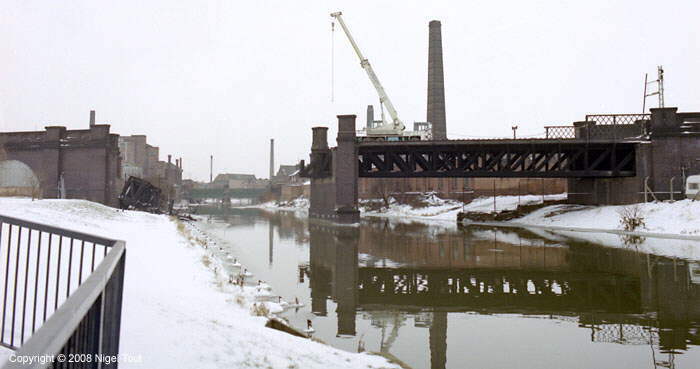 The north viaduct and the bridge over the River Soar has one span completely removed, in the snow in 1979. 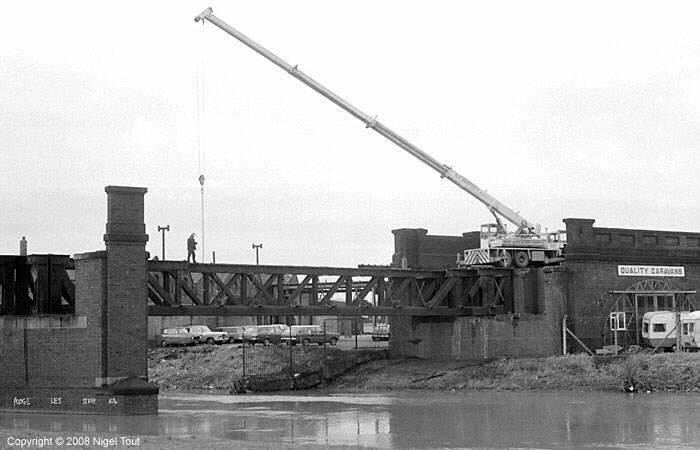 The bridge over the river Soar, looking north, with the demolition crane poised to complete the job. The remains of the southern span lay forlornly in the snow. 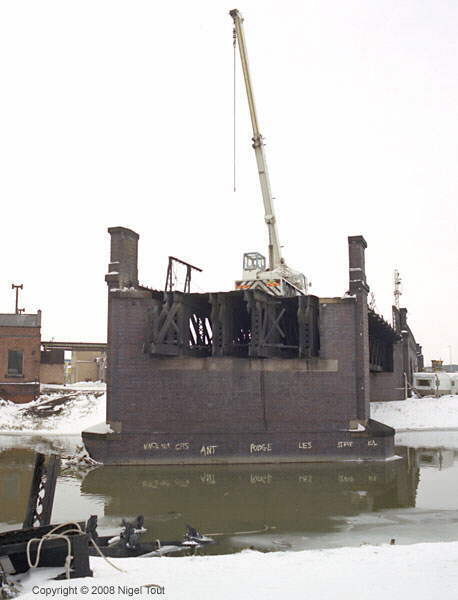 Shortly afterwards demolition of the remaining span was well under way. A few weeks later and the all of the bridge girders have been removed, looking north from on top of the viaduct. The site of the double span bridge across the River Soar, looking south west from Saint Margaret’s Way, with the centre support still in position in the middle of the river. The scene looked similar to this for over 20 years. In October 2004 the viaduct on the north part of the river was demolished. The resulting rubble was used to strengthen the bank of the river and allow a little extension of the caravan sales area. The photograph above was taken from Saint Margaret’s Way, and the photograph below, of the other side of the viaduct, was taken from Abbey Gate. Oxy-acetylene cutting under way on the bridge over Slater Street, in the middle of the north viaduct. Looking west, 1982. Panoramic view along Northgate Street shortly before demolition started in 1982. On the left is the bridge over the canal while on the right is the magnificent skew bridge leading into the Central Station which is out of sight. 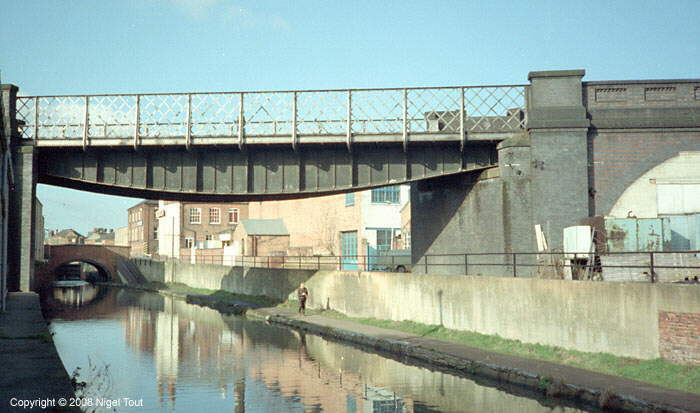 The bridge over the Grand Union Canal in 1982, looking west. In the background is the brick bridge carrying Northgate Street across the canal. View from the bridge over the canal looking west, just as a Midland Red type ‘D9’ bus is heading along Northgate Street towards the city centre. 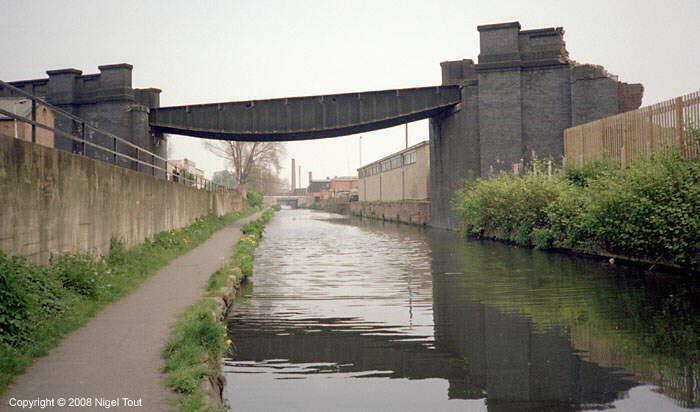 The bridge over the canal from the west. 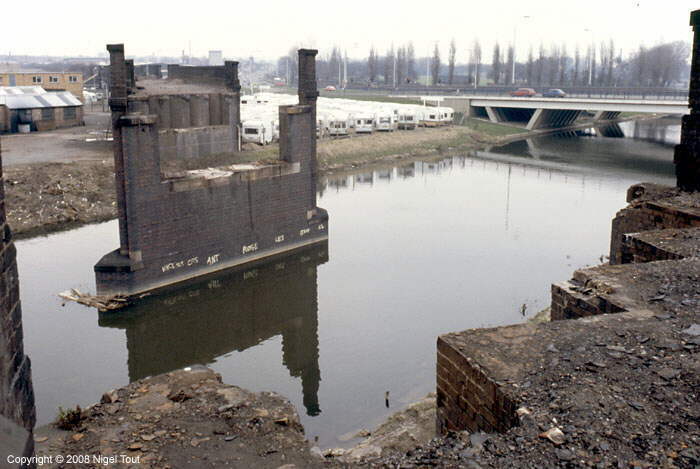 A few weeks later, immediately after the demolition of the length of viaduct shown below, the bridge over the canal was demolished. Looking east, 1982. 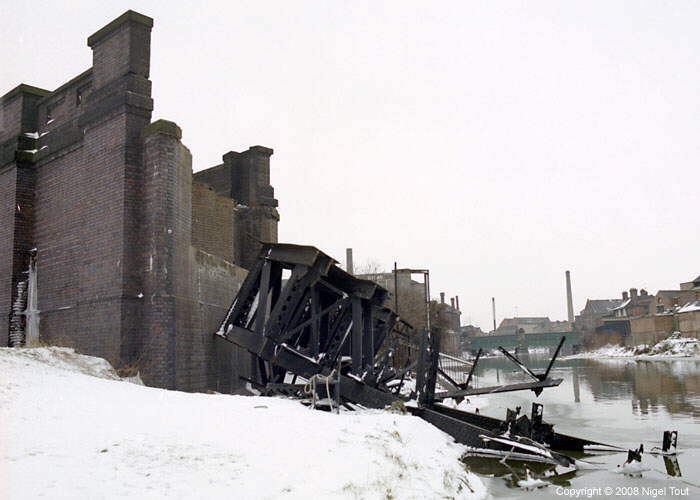 The sad sight of demolition of the viaduct between Northgate Street and the canal, in 1982. 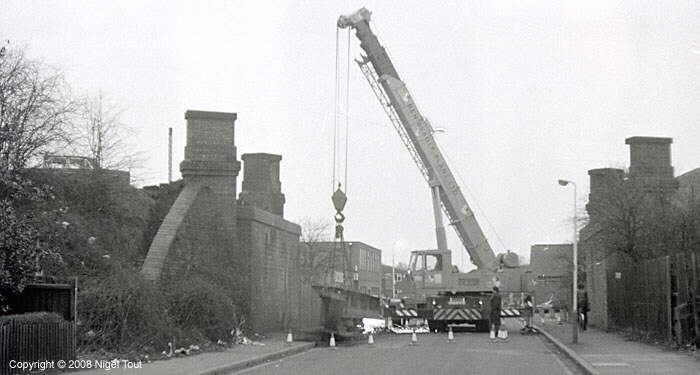 During the demolition of the part of the north viaduct between Northgate Street and the canal in 1982 the preserved Great Central Railway was given the opportunity of rescuing anything of use before it was crushed. Volunteer workers are selecting some of the special bricks which would be especially useful in repairing bridges. 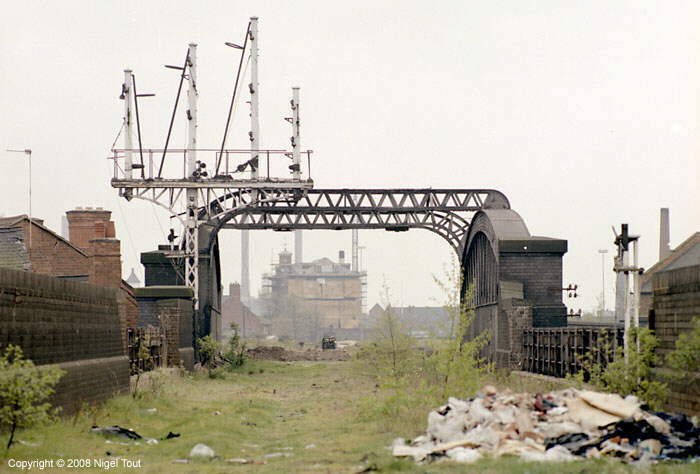 Looking south through Northgate Street bridge and over the cleared site of Leicester Central station using a telephoto lens, 1980. 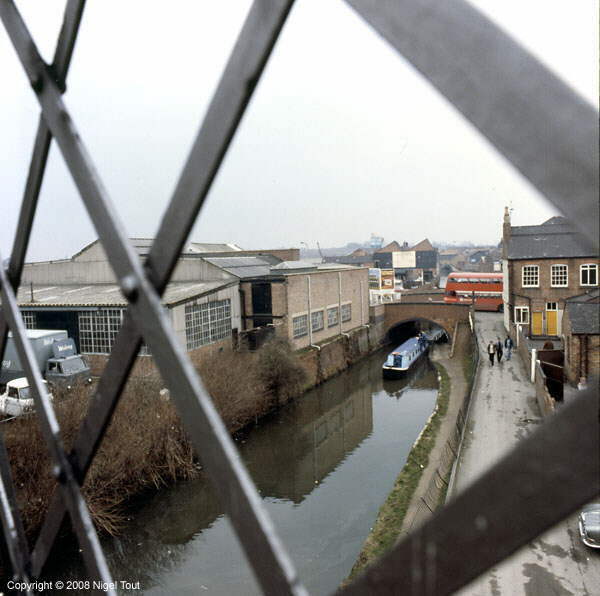 The lens has made the Pex building, alongside the Braunstone Gate viaduct, look much closer. Some buildings were very close to the bridge and must have been very noisy when a train went over. 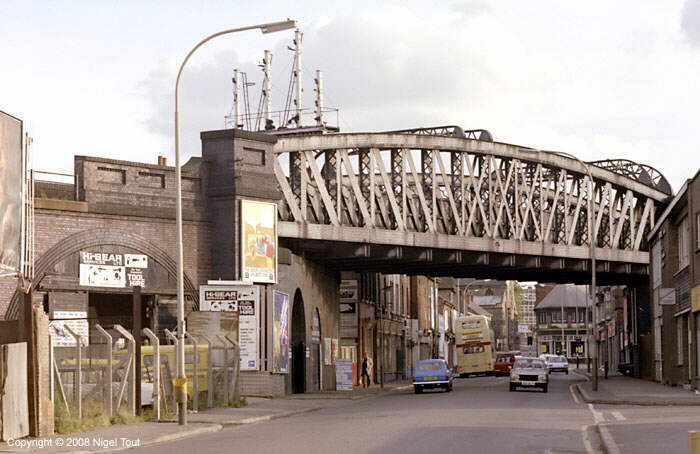 Northgate Street bridge, looking south towards Leicester Central Station,1980. 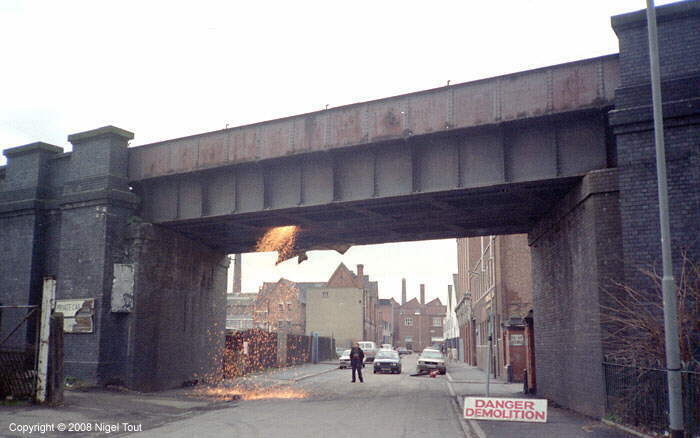 Northgate Street bridge after demolition has started, 1981. 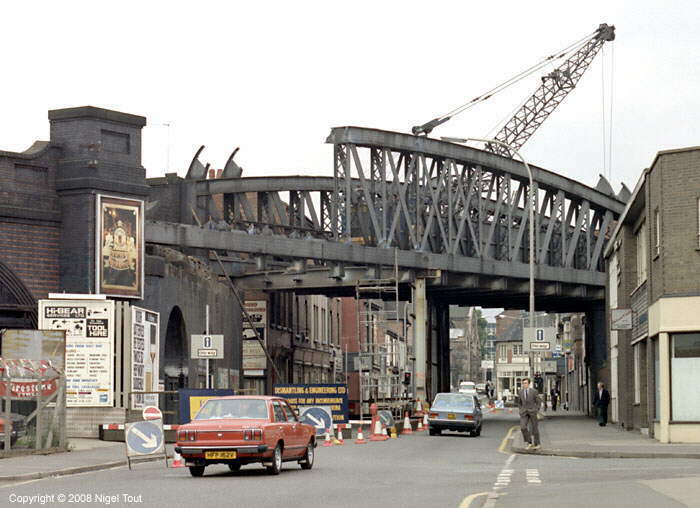 The sad sight of Northgate Street bridge with demolition nearly complete, 1981. 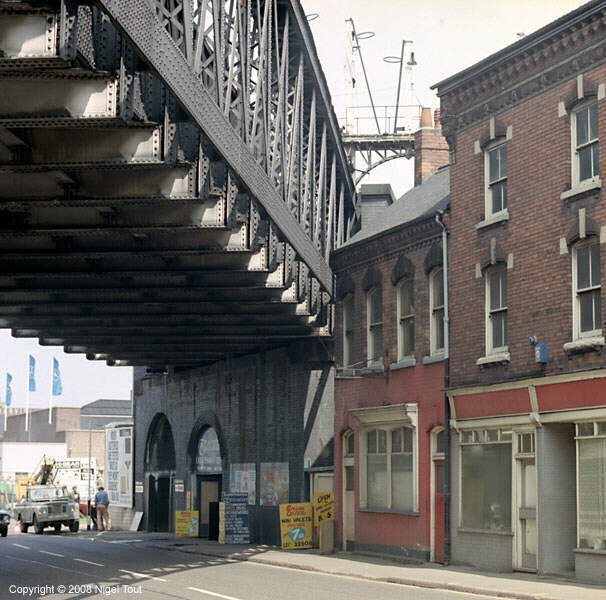 The view looking along Northgate Street would never be the same without the railway bridge. Soon to follow would be the viaduct on the left and later the Van Damme Bar, which was originally the Great Central Hotel, was demolished to allow road widening at this busy junction. 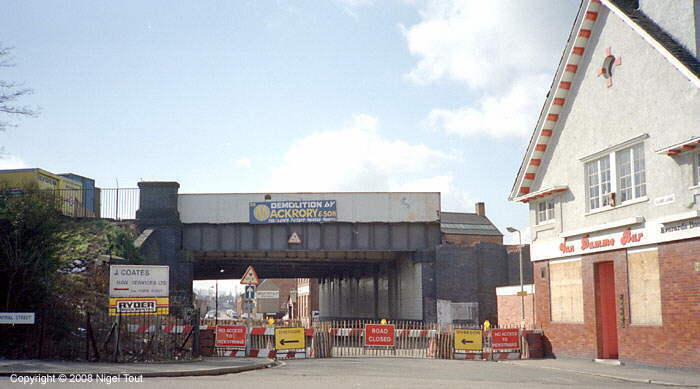 The start of demolition of the bridge over Soar Lane, at the north end of Leicester Central Station, looking west, 1983. The Great Central Hotel, on the right, had become the Van Damme Bar, but was now closed and boarded up and was later demolished too. Demolition of the bridge over Soar Lane is well advanced, looking west. 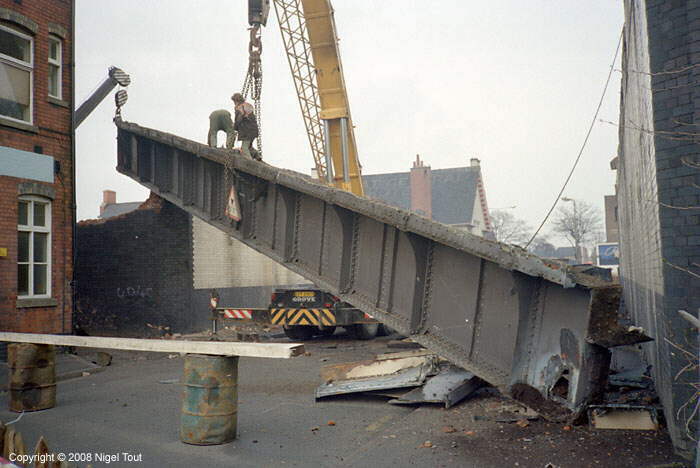 The final girder of the bridge across Soar Lane is brought down, looking east, 1983. 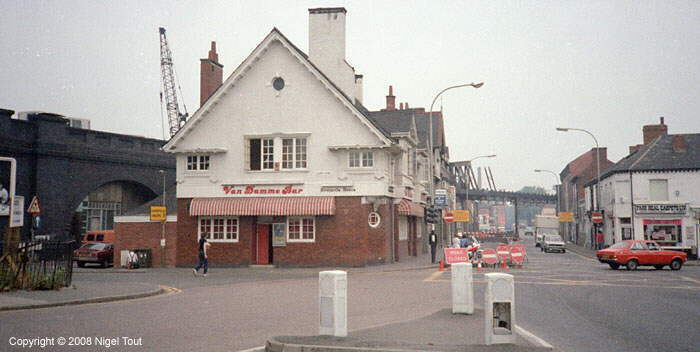 The viaduct immediately to the north of Soar Lane was demolished not long after, and the boarded up Great Central Hotel (which had lately been renamed the Van Damme Bar) was demolished too. Photographed in June 2018 from a position close to that of the previous photograph. Prior to redevelopment, an archaeological excavation was taking place underneath the remains of the viaduct immediately to the north of Soar Lane. 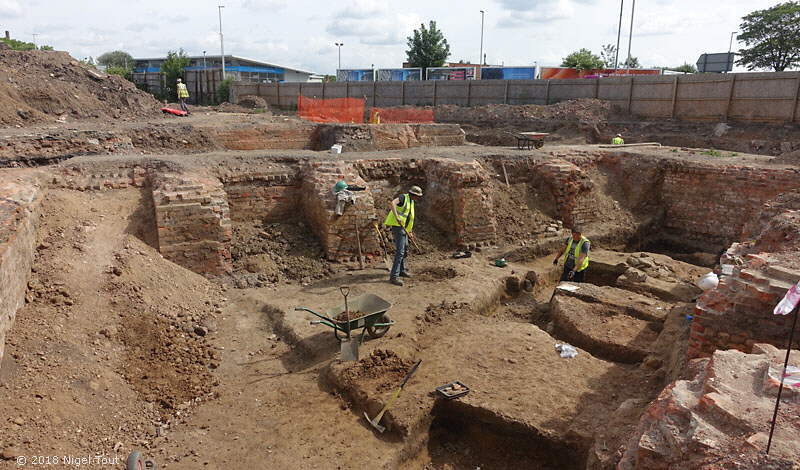 The excavation was investigating ancient remains surviving below the viaduct but dramatically reveals the foundation walls of the viaduct arches. See the page Old Photographs: Leicester Demolition 2 for photographs of demolition south through Leicester from the Central station. 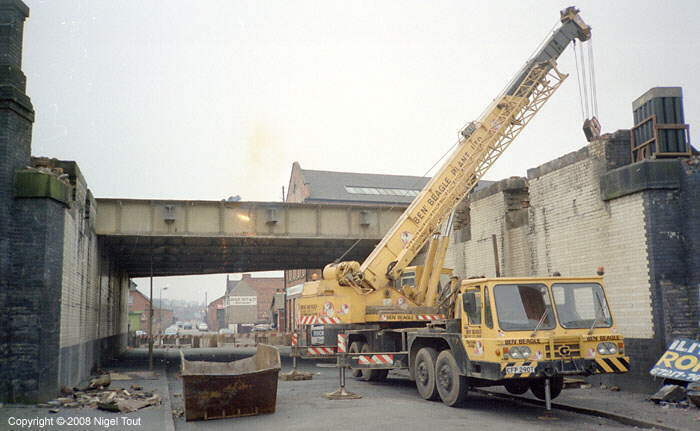 There are a few photographs of the demolition of Leicester Central station on the “Last Day & Demolition” page, and more are available on the Railway Archive site.